It is often said that amazing products have both great form (the look) and function (how it performs). SHOFT improves both the form and the function of your existing seat belt. SHOFT is a small palm-sized product made of soft material that fits over the top of your vehicle seat belt tongue (that’s the bit you grab and pull down every time you buckle up). After the 2 second install SHOFT reduces the usual ‘slack’ that creeps in to the seat belt. How does it do this? 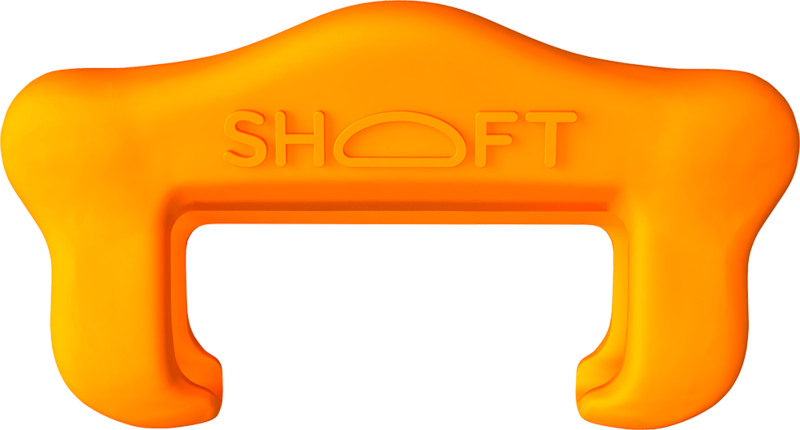 SHOFT has a built in ‘brake pad’ made of GRIPtene that engages the seat belt when you buckle up and remove the slack by tugging up on the diagonal section of the seat belt. Keeping tension on the lap belt portion of the seat belt helps comply with RoSPA & NHTSA safety guidelines and also helps with better posture as it reduces ‘slouching’. In essence, SHOFT helps you get optimal performance from your seat belt. Although seat belts save many lives each year, they could save many more if they were ‘worn’ as they were designed and tested. Seat belts are crash tested with all slack removed, but this is not the ‘real world’ situation. In practice, most of us wear our seat belts with slack in the system. This has 2 important consequences. 1. We tend to slip down slightly in our seats, ‘slouching’. This usually leads to strain on the lower back and often back pain. 2. A loose lap belt tends to ‘ride up’ from the pelvis (where it should be) and ends up on the stomach. This compromises safety. See the video above as well as visit RoSPA.com (or NHTSA in the USA) to learn more about proper wearing of seat belts.